It is one of the most famous staircases in the world, it was the first spiral staircase ever. Every day many tourists from all over the world come to see the famous Scala del Bovolo. The view from outside to the open staircase (see picture) is free. But if you want to go up the stairs, you have to pay an entrance fee. The Scala del Bovolo is something like an insider tip among the many atrractions of Venice, it does not belong to the very big sights of Venice. 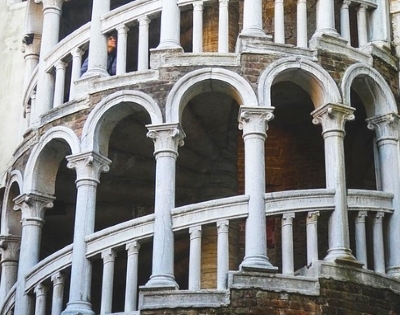 What is the Scala del Bovolo in Venice? The Scala Contarini del Bovolo is part of a larger building, the Palazzo Contarini del Bovolo. It is a very old house, it was built in Gothic style. 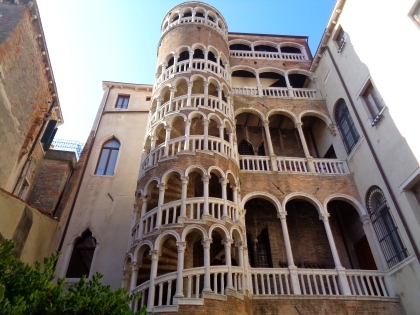 At the end of the 15th century, during the Renaissance, the owner of the palace at that time, Pietro Contarini, commissioned an architect to build the spiral staircase, which was completely new at that time. The external staircase, reminiscent of a snail shell, was to become the most famous staircase in the world. Especially beautiful is also the upper dome, a viewing platform with a great view over Venice. In the palace building there is also a hall with famous works of art (mainly pictures), the Sala del Tintoretto. Where is the famous staircase in Venice? The palace is located in a small side street in the middle of Venice in the district of San Marco. The famous Piazza San Marco is about 300 metres to the south, the Canal Grande about 150 metres to the north. A good point of orientation is also a branch of the chain H&M about 50 metres northeast of the stairs Scala del Bovolo. The palace is not easy to find. If you are familiar with the smartphone, enter "Scala Bovolo Venice" in Google Maps or similar. This is probably the fastest way to find the famous snail shell staircase. One gets to the stairs by going up the alley "Calle Locande" and following the signpost. The staircase of Bovolo on the city map. The sight is in the middle of Venice, a few hundred meters north of St. Mark's Square. From the outside you can see the Scala del Bovolo for free. But it is really interesting to climb the famous spiral staircase in Venice and enjoy the view from above. Also the small art exhibition in the Sala del Tintoretto is included in the entrance fee. Admission to the Palazzo Contarini del Bovolo costs 7 euros. People under 26 years or over 65 years pay an entrance fee of 6 Euro, children under 12 years are free (prices from the beginning of 2019). The palace is open every day of the week. You can watch the Scala del Bovolo from 10:00 to 18:00, between 13:30 and 14:00 there is a short lunch break. There are no opening hours only on 4-5 very important holidays in Italy such as Christmas, New Year, 15 August (Assumption) and All Saints' Day (1.11. ).